It is very common around our area especially down in the woods. It is apparently a member of the rose family but it seems to love shady areas and grows well along our hedge and in our wooded area of the garden. 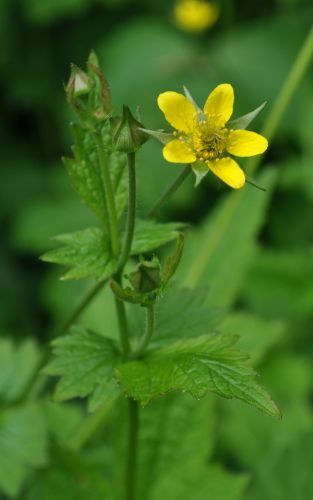 Tradition has it that wood avens have the power to drive away evil spirits, protect against rabid dogs and venomous snakes. It was associated with Christianity because its leaves grew in threes and its petals in fives (reminiscent of, respectively, the Holy Trinity and the Five Wounds of Christ).